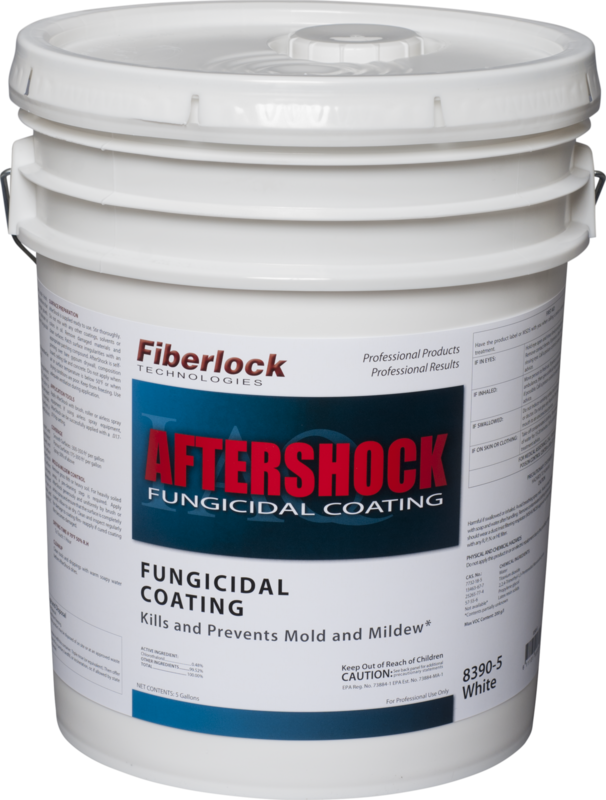 AfterShock offers the ultimate combination of durability, application ease, and fungal resistance to address mold growth in nearly any situation. The white, antimicrobial coating kills residual mold and mildew remaining after pre-cleaning and disinfecting contaminated surfaces, and inhibits the future growth and spread of mold and mildew. 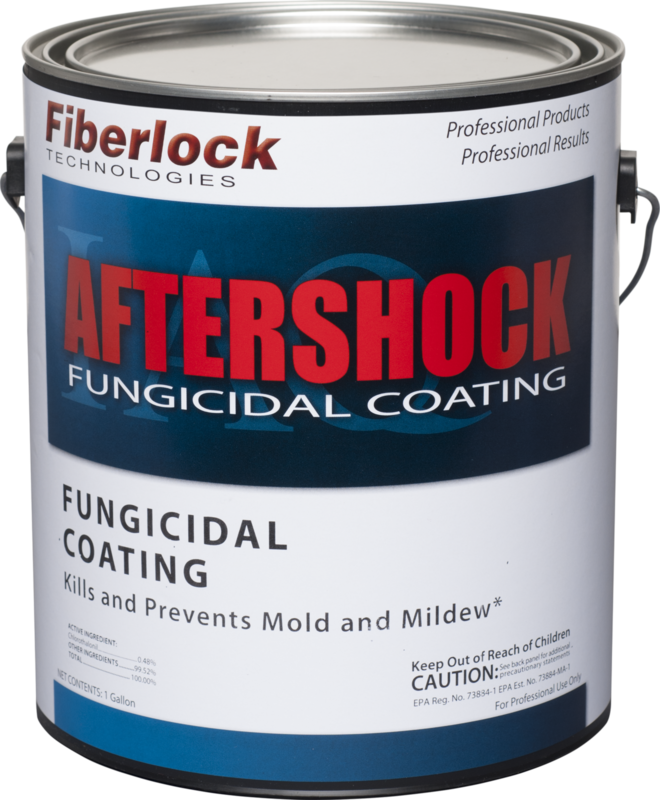 AfterShock is recommended for use on interior wall surfaces in residential, commercial, and institutional buildings. AfterShock is supplied ready to use. Stir thoroughly. Do not mix with other coatings, solvents or colors in oil. Remove damaged materials and clean surfaces. Surface must be free of dust, mildew, mold, dirt, grease, loose paint, oil, glue size, calcimine, wax, soap and other surface contamination. Patch surface irregularities with an appropriate patching compound. AfterShock is self-priming over bare gypsum drywall, composition board, ceiling tile and concrete. Do not apply when air or surface temperature is below 50°F or when drying conditions are poor. Use adequate ventilation during application. Clean, then prime with Fiberlock IAQ™ 4000 acrylic DTM primer. Seal knots and stains with Fiberlock IAQ 5000 stain-blocking primer. Apply one coat of Fiberlock IAQ 3000 acrylic block filler if a denser surface is desired. Apply AfterShock with a brush, roller or airless spray equipment. Remove gross filth or heavy soil. For heavily soiled areas, a pre-cleaning step is required. Apply AfterShock generously and uniformly by brush, roller or airless spray and ensure that the surface is completely coated. Allow to air dry. Clean and inspect regularly for damage to coating film – reapply if cured coating film becomes damaged. 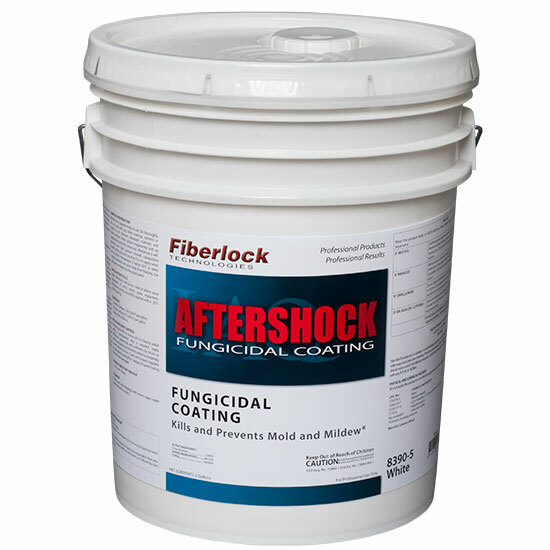 AfterShock will kill residual mold and mildew on the surface, and then will prevent the growth of mold and mildew on the surface of the cured film. Clean tools and drippings with warm soapy water before AfterShock dries. Dispose of all waste according to all existing local, state and federal regulations. It is a violation of Federal law to use this product in a manner inconsistent with its labeling. Do not contaminate water, food or feed by storage or disposal. PESTICIDE STORAGE: Close container after each use. Keep from freezing. Store in a dry place at temperatures between 40°F (4.5°C) and 90°F (32°C). ffer for recycling or reconditioning, or puncture and dispose of in a sanitary landfill, or incineration, or, if allowed by state and local authorities, by burning. If burned, stay out of smoke.